We sent our brewer, Grahame, along to the not too far away city of Ely, on a mission to seek inspiration, and find out what other brewers were doing with their dark beers. 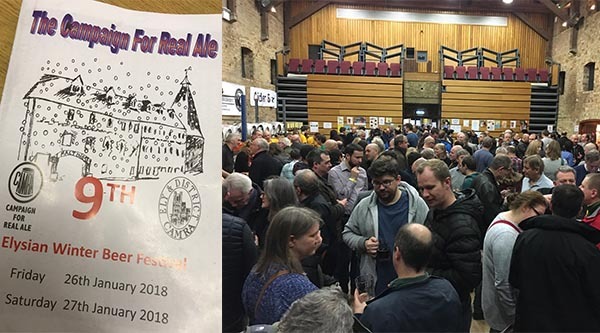 We generally do dark beers well in Norfolk, because of our hard water (which unfortunately makes brewing pale beers a lot harder), so there were bound to be a few good local ones to try, being a CAMRA Winter Festival and all that, as well as some out-of-towners too. Ely Beer Festival is a good beer festival, by no means the biggest, but nicely done. I arrived by train, and you can see the festival’s home, The Maltings standing by the river and boatyards, as you chug (hmmm clunk) into Ely station. You kind of feel you’re in for a good night, especially with such a short stagger back to the train. My train left Norwich at 6.15 so I arrived around 7ish, and it was already a full house, with a sizeable queue. Inside was a good vibe, and a friendly crowd, even before I’d had my first drink. It seemed to be a good mix of your classic CAMRA types, noses down in their programmes or holding a glass up to the light, alongside a younger crowd who were there for a good Friday night. And the beer selection catered for all. I winced a bit when I saw the cooling was wet cloths under hessian bags, but the beers were in good nick, and at the right temperature, so those hessian sacks worked. There were echoes of Cambridge Beer Festival with a collection of brewery bars, including some of our favourites…Moonshine, Bexar County and Three Blind Mice, with the last two serving Key Keg as well as cask. I caught up with the brewers to share notes and applauded Dan from 3BM for using his two young children for advertising in their bright pink 3BM t-shirts up on stage. Nice move. Too much talk, I came with a mission, dark beers. I tasted a bunch, but these ones were noteworthy. The festival booklet described it as ‘Does what is says on the tin’. It’s right, it does, and in a very good way, with plenty of coffee going on, soft, light, and a hint of Pecan. We generally don’t throw enough random stuff into our beers, and this shows it can work when done well. Didn’t try their ‘That’s Mintal’, but Frank tutted when he saw the programme as he thought he’d had an original idea of dry-hopping with fresh mint leaves. Still worth a go though. Had this before and it was on top form tonight, and not as sweet as I remembered. Well-balanced. I also had a sizeable taster of their Vodou Mango. Not quite sure I’d class it as a NEIPA, but that’s not to play it down, as it was very good and certainly full of those juicy, citrussy hops. I might be wrong but I think this brewery is an ex Blue Monkey, broken away from the troop and brewing in Derby after trialling at Bexar County. We did a Mocha Mild last year chucking in cacao nibs, lactose and cold-brewed coffee, so I was keen to try this. Yeah – it was good. Again the sweetness wasn’t overdone (where I think our Mocha Mild went too far), and the extra alcohol gave it fullness. I’ll try more from these monkeys. I’ve decided I love coconut in beer. This had lots of coconut, making the beer creamy and smooth, yet you could also get a good noseful of the Sorachi Ace hops at the same time. I’m going to seek them out when I head back up to Sheffield soon. Damn – I didn’t try any Nene Valley beers and must have completely walked past their bar. Again damn. I had plenty of tasters of a few others, and of course checked up on our beers – Tropical Winter (the grapefruit had mellowed out nicely now, but it took it’s time), our new special Dark Ash (good but needs a bit more time to mature and condition to be honest) and Slate (was really pleased with this one). So what did I come away with? Firstly, I feel some other CAMRA festivals need to up their game and look at ones like this if they want to keep up with everyone’s tastes. And on the beer front, I have a few new breweries to keep an eye out for when I’m out and about. And thirdly let’s try chucking more sh*t in our dark beers, and see what new flavours we can come up with.